Role: Volunteers work on achieving the goals set out in the Care Management Plan, including improving literacy and numeracy, promoting early childhood development, increasing emotional support and care for children. Although Argentina has made a lot of progress since the economic crisis in 2001-2002, it still faces considerable challenges as a result of income disparity and regional poverty. This is in evidence in the neighbourhoods we work with: communities with problems such as limited access to education, marginalisation, drug use, and general lack of support for children. As a volunteer, you will provide that added extra element of individual care and attention that every child needs, but which the staff in the organisations we work with rarely get the chance to provide. As a volunteer, your main role is to support the local staff at our placements and provide children with vital educational and emotional support. In particular, volunteers will focus on improving children’s literacy and numeracy skills, and promote early childhood development. You are likely to be asked to help with a wide range of activities, depending on the age group and needs of those you are working with. Volunteers may be required to assist the staff with basic duties at certain times of the day, but there will be other occasions when the work is less structured and you will be able to spend time interacting with the children. 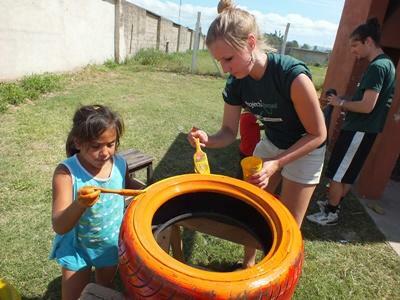 Volunteers may find themselves arranging sports games, arts and crafts, and other fun educational activities. Older children may also need help with their homework in the afternoons. While we mainly work with community centres, kindergartens and dining halls, there is also the possibility of volunteering at centres for disabled people and others with special-needs. As a Care volunteer you will be able to take part in regular workshops, run by our project coordinator. These workshops will provide you with information about the Care system, as well as tools and tips on how to organise your work. This will also be an opportunity to receive and give feedback, and share ideas about different activities you can organise at your placement. You can read more detailed information about the aims of the project in our Argentina Care Management Plan. You can join the Care project in Argentina for one, two or three weeks if you don't have time to join us for four weeks or more. This project has been selected by our local colleagues as being suitable for short term volunteering for both the host community and the volunteer Although you will gain a valuable cultural insight and work within the local community please be aware that you may not be able to make the same impact as someone volunteering for a longer period.